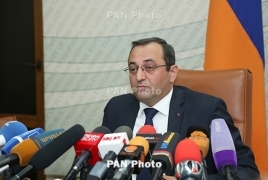 PanARMENIAN.Net - Minister of Economic Development and Investments Artsvik Minasyan revealed on Monday, September 3 that Armenia has received investment proposals worth $1 billion following the velvet revolution in spring. According to Minasyan, a lot of individuals and representatives of organizations have visited the Ministry to learn more about the investment climate in the country and unveil investment projects. The projects that have so far been announced are worth more than $1 billion, Minasyan said. “But we are also trying to assess which part of that sum is realistic and have come to the conclusion that at least $240 million is plausible,” the Minister added.